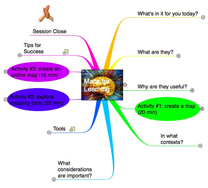 1 What are concept maps? 2.3 Which tool suits what purpose? Concept mapping supports learning by drawing out prior knowledge, building on it and providing a framework for learners to incorporate new knowledge and make meaning. Technique developed in the 1970s by Joseph Novak at Cornell University for use with science students. Associated with constructivist approaches to learning. illustrating relationships between different processes or components. maps are developed by an individual or group and organized in a way that makes sense to them - promoting a sense of ownership - important to motivation. connects prior knowledge to new learning and highlights gaps in knowledge - making it easier for learners to know what they don't know and need to know. allow focus on details while retaining "big picture"
Which tool suits what purpose? This is a work in progress, please help us with a few examples. Brainstorming yes may be too slow yes, for collaboration Brainstorming/resource planning in Bubbl.us Bubbl.us is a good tool for brainstorming. C-Map allows for real time collaboration. Investigation/Diagnosis yes yes yes Diagnosing a Headache in Chinese medicine with Freemind mapping tools that allow for decision trees are useful here. Notetaking yes no yes Graphical Note Taking on an iPad. Tools need to have very low tech threshold for note-taking without barriers. Problem Solving yes yes yes process example Bubbl.us best for ease of use. Others allow for more complexity to be added. 99 Mind Mapping Resources - including video, books, articles, etc. Ausubel, David P. Learning Theory and Classroom Practice. Bulletin No. 1. The Ontario Institute for Studies in Education, 1967. Ekhaml, Leticia. "Graphic Organizers: Outlets for Your Thoughts." School Library Media Activities Monthly 14, no. 5 (January 1998): 29-33. Chiou, C. (2008). The effect of concept mapping on students' learning achievements and interests. Innovations in Education and Teaching International, 45(4), 375-387. Francis, R. W. (2006). 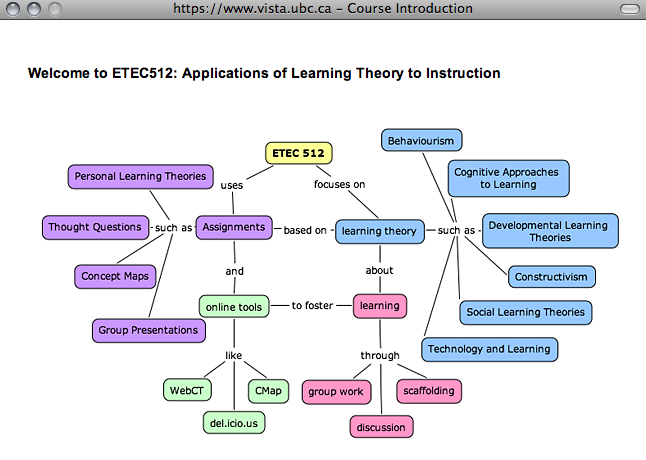 Using concept maps as assessment tools: Defining understanding. College Quarterly, 9(3).